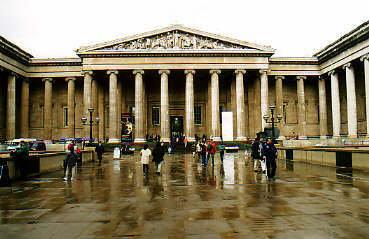 All the museums in London have one thing in common: you go in when it's pouring, and when you have seen everything, it will have stopped raining. 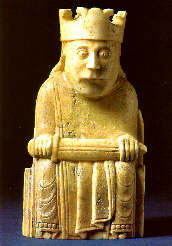 Our first visit to the British Museum was a very short one. As usual, we got in when it was pouring. After no longer than half an hour there was an alarm sounding: the whole museum had to be evacuated. When we were outside again, it hadn't even stopped raining. The next day we came back to see the rest. 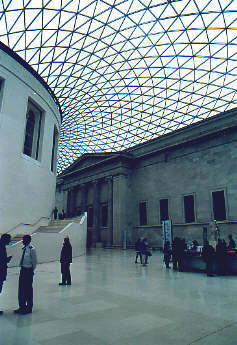 Since 2000 the inner square of the British museum is covered with a glass roof. It is astonishing. 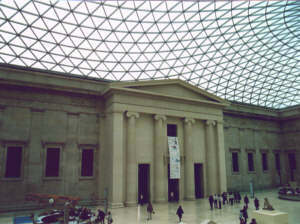 You should visit the museum if only to see the roof. You can easily point out which people are in the museum for the first time: they're the ones who are staring at the roof. Of course, there is a lot more to be seen. 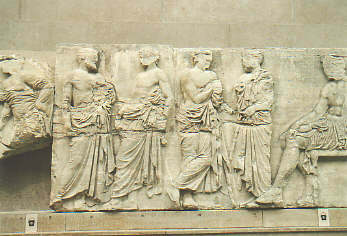 Every part of the world can be admired in the British museum. 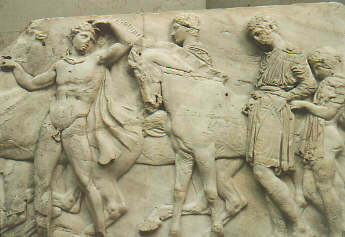 The pieces from the Parthenon (Elgin Marbles) for instance (at least at the moment), great pieces from Egypt, the Persian and the Arabic world, art from the far East: China, Japan, Korea, Celtic art, and so on. There are so many things to be seen, you can't see all of it, even if you take all day. So have have to make your choice. 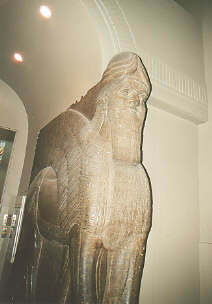 The Egyptian section of the museum is world famous. 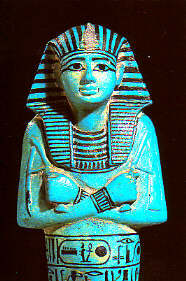 It even has an important role in the movie "The Mummy returns". We think they shot the scenes before the new roof was built; a roof like this would look very strange in a movie that plays in the 1930's. We spent quite some time in the Korean section. For us, this was the first time we saw Korean art and we rather liked it. Strangely enough, there were lots of Korean-looking people around here. Their presence added to the oriental atmosphere.